ZANZIBAR, Tanzania—Sibeha Mustafa wades through the shallow waters of the Indian Ocean inspecting her small seaweed farm in Zanzibar. The sun glares off the island’s white sand beaches and the turquoise waters shimmer. Mustafa wears dark sunglasses and a colorful scarf is wrapped tightly around her head to protect her from the sun. She plants two wooden stakes firmly in the sand and attaches a yellow rope dangling with seaweed. When the seaweed is ready, Mustafa will carry it to shore and dry it. The seaweed is then exported to Europe, North America and Asia. A gel called carrageenan is extracted from the dried seaweed and used as an additive in medicine, cosmetic creams, and food like ice cream. After tourism revenues, seaweed exportation is the second biggest contributor to Zanzibar’s economy and employs thousands of women like Mustafa. When the seaweed is exposed to high temperatures, it gets stressed and can die. But recently Zanzibar’s seaweed industry has been struggling. “The weather is changing and it’s affecting our seaweed,” said Mustafa. 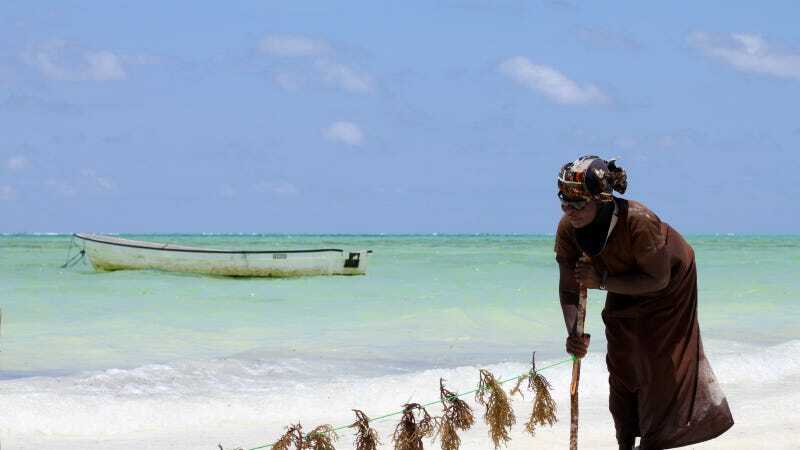 Seaweed farming was introduced to Zanzibar in the late 1980s and it quickly became one of the world’s largest exporters behind the Philippines and Indonesia. The island’s warm waters, sandy beaches, and large intertidal zones make it the perfect place to grow seaweed. But in recent years, water temperatures have risen dramatically. Dr. Flower Msuya, a marine biologist at the Institute of Marine Science at the University of Dar es Salaam, said temperatures have risen from an average of around 86 degrees Fahrenheit to over 95 degrees in recent years. “When the seaweed is exposed to high temperatures, it gets stressed and can die,” said Msuya. It’s not just the temperatures that are problematic, with El Niño the weather has become less predictable, making it difficult for farmers to know when it’s going to rain. “When you are drying seaweed it’s not supposed to be in contact with fresh water,” said Msuya. She believes the exposure to rain is decreasing the value of the product. Sibeha Mustafa inspecting her small seaweed farm in Zanzibar. According to Msuya some farmers’ production is down 40% from previous years. And it’s not just happening in Zanzibar. Reports in local media show production in the Philippines has dropped as well. Mustafa relies on seaweed farming to help feed her family of ten. She only makes about $25.00 a month, and she worries if the waters continue to get warmer she may no longer be able to provide for her children. One positive is that demand for seaweed remains high. “Globally the seaweed aquaculture has always been on the increase,” said Thierry Chopin of the International Seaweed Association. The way forward for seaweed farming is to go for deep water farming. Msuya says there’s not much that can be done to help lower water temperatures and save Zanzibar’s seaweed farms. “The way forward for seaweed farming is to go for deep water farming, we’re talking about one, two, three meters at the lowest tide,” she said. Deep water seaweed farming is done using floating lines that are anchored to the ocean floor. The deeper waters are cooler and provide an even better environment for the seaweed to grow, but it’s a much more complicated and expensive process and many women in Zanzibar don’t know how to swim. Msuya is part of the Zanzibar Seaweed Cluster Initiative which is trying to find affordable ways to help farmers move to deeper waters. Together with the government of Zanzibar they are trying to equip and train farmers. But she said finding a solution is a long process and many farmers are already suffering from the warming sea. Seaweed farming has helped empower thousands of women in Zanzibar and that could be at risk if solutions are not found quickly.